Whitworth University is featured as a top school in the country for 2010-11 on CollegesofDistinction.com, an online guide that takes a fresh look at colleges and universities appealing to students' unique and varied interests. 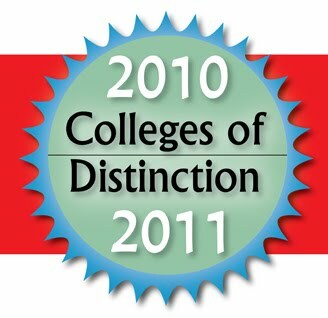 Based on the opinions of guidance counselors, educators, and admissions professionals, Colleges of Distinction honors colleges excelling in key areas of educational quality. "Schools selected as Colleges of Distinction create well-rounded graduates and are among the very best in the country," says Tyson Schritter, executive editor of Colleges of Distinction. "While each school is one of a kind, they all share a common theme: they are all a great place to get an education." In order to qualify, Whitworth University was required to demonstrate excellence in the four distinctions: engaged students, great teaching, vibrant communities, and successful outcomes. The goal of Colleges of Distinction is to provide students, counselors, and parents with information about colleges and universities that excel in these four areas. Featured schools take a holistic approach to admissions, consistently excel in providing undergraduate education, and have a truly national reputation. Whitworth also was featured in Colleges of Distinction's printed guidebook, published in 2008. Offering dynamic college profiles and easy-to-use search tools, the Colleges of Distinction website includes tips from high school guidance counselors, essays from college students, presidents and other members of campus communities. To learn more about the online guide, visit http://www.collegesofdistinction.com/. Student Horizons, Inc. is a digital services company that devotes itself to higher education. Their mission focuses on enabling students to find colleges and universities that appeal to and complement their unique personalities and aspirations. Founded in 2002, Student Horizons, Inc. is located in Bethesda, MD. Katie Creel, director, strategic partnerships and development, Student Horizons, kcreel@studenthorizons.com.